If you read the About page of this website, you’ll know that providing more and better diversity in science fiction and fantasy are key objectives of mine. Seeing as how it can be difficult to find worthwhile black characters in these genres of entertainment, I decided to open a segment where I highlight and give my thoughts on black characters I feel are worth looking into. I was going to call this segment “Cool Black Characters,” but decided to go another route. Our inaugural entry is a very heavy hitter. 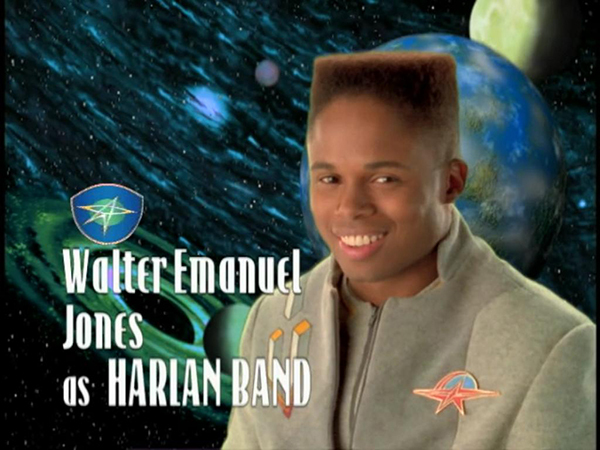 He is Harlan Band from the ‘90s Nickelodeon show Space Cases. To best discuss this character, I must use spoilers. So beware! 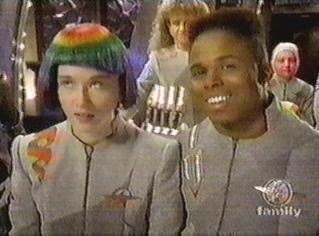 Space Cases is a show from my youth that I remember very fondly. It instantly got my attention for a number of reasons. First, it starred Walter Jones, who, at the time, was a huge deal in children’s television from playing Zack, the original Black Ranger from Mighty Morphin’ Power Rangers. Zack was one of my favorite characters from that show, and when he left along with my other favorites, Jason and Trini, my interest pretty much left with them. I didn’t return to Power Rangers until a decent while later. Another reason Space Cases got my attention was that it was a science fiction kid’s show in the vein of Star Trek. At the time, Nickelodeon largely preferred silly comedy and game shows, and I always liked action and adventure much better than things like Rugrats, Double Dare, or Rocko’s Modern Life. My interest was piqued when Nick started broadcasting programs like Space Cases and The Secret World of Alex Mack. The crew of The Christa. 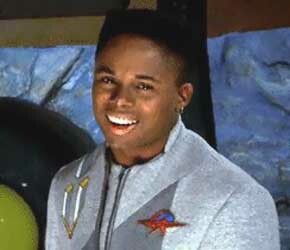 I was also attracted to Space Cases because it starred a black character in the lead role. That’s rare for a fantasy adventure kid’s show even today, so imagine seeing this in 1996! I can’t say for sure, but it’s my belief the only reason a black character was given such prominence was because the stars aligned and a black children’s actor with a lot of star power just happened to audition for the role of Harlan Band. I wouldn’t at all be surprised if Harlan was originally conceived as a white character, or just a race-less character. Not that anything is wrong with any of that. I just want to point out that I imagine this is a case of us (science fiction/fantasy fans who like seeing black characters in strong roles) getting enormously lucky rather than the production setting out to “make a difference,” as in the case of a show like Static Shock. Harlan’s “blackness” is never once mentioned and is always a non-issue, which, for me, is perfectly fine. As an ethnically diverse kid who loved science fiction and fantasy, it pretty much didn’t get much better than Space Cases back then. As such, Space Cases is a true trailblazing show, and even though most people who think back to it do so with admiration and esteem, it isn’t often championed for its prolific use of a diverse character in a ‘90s science fiction kid’s show. Well, now it’s time for that great accomplishment to be fully recognized! I recently revisited Space Cases. Having not seen it in literally about twenty years, I wasn’t sure what to expect. 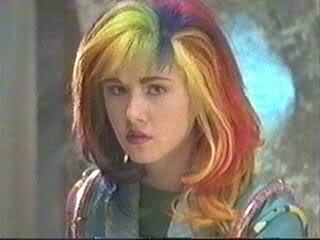 Oh, sure, I loved it as a small child, but … I mean … low budget, Star Trek wannabe, mid-‘90s kid’s show on Nickelodeon? Needless to say, a rather large part of me was expecting this obscure show to have not aged well, and to be a generally hokey and dumb affair, with its saving graces primarily being nostalgia and cheesiness. Yet, after watching the whole series, I am pleasantly surprised at how genuinely good, smart, and well-acted it is. The nostalgia and whatever cheese there is are just added benefits to this authentically great show! Space Cases is very legit as science fiction shows go, and the people who worked on it are a testament to that. The creators are Peter David and Bill Mumy, both luminaries in the world of science fiction. David is the writer of various Star Trek novels, and many comic book fans know him from his landmark runs on Supergirl, Aquaman, and The Incredible Hulk. I’m mostly familiar with Bill Mumy from his role as Lennier in Babylon 5, a hallmark science fiction television series. However, his most iconic role may be Will Robinson from Lost in Space. Other notables include Mark Hamill and George Takei, who play alien antagonists, and legendary science fiction author Harlan Ellison, who narrates a segment of the season one intro and does the title drop. 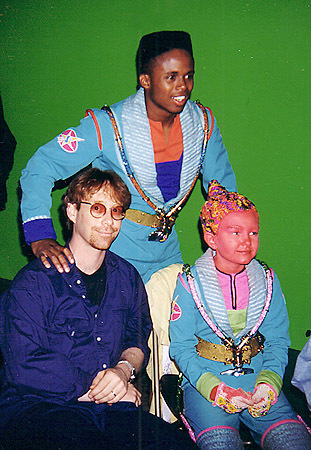 Walter Jones with Space Cases creator Bill Mumy and co-star Paige Christina, who plays the cheerful Mercurian Rosie Ianni. The show is about a group of under achieving teenage space cadets who wind up irresponsibly boarding an alien ship called The Christa that just appears at their outer space academy for an unknown reason. Concerned for the kids’ safety, two of their adult teachers, Commander Seth Goddard and T.J. Davenport, also board the ship in pursuit. Due to the teens’ clumsiness in operating the vessel, they wind up piloting it straight through a spatial anomaly which transports them through space, roughly seven years’ time away from home. As you might imagine, this setup allows for all manner of zany adventures. Earlier in this article, I wrote that Harlan Band is the star of the show, and he is. However, Space Cases technically has an ensemble cast. Harlan is the true leader of the students, at least in his mind. The other crew members, particularly Catalina, are not necessarily quite as convinced of Harlan’s claims of being their natural-born leader. Harlan’s hero was his father, and couldn’t wait to grow up to be just like him: an intrepid, heroic starship captain in the Stardogs. When his father was killed in the Spung War, it shattered Harlan. Two years later, his late father’s commanding officer married Harlan’s mother. His step-father was an exacting, unforgiving soldier, and his constant demands for perfection from Harlan spiraled the boy down deeper in despair and self-doubt. Being placed in the Space Cases class with an Andromendan was, as far as Harlan was concerned, hitting rock-bottom. Now, lost in space, Harlan is finally regaining his confidence as his piloting and leadership skills blossom. The the main focus is undoubtedly given to Harlan Band, a brash earthling who can be annoyingly full of himself, but when it comes down to it, is a great guy. This character is written excellently by the writers and is played really well by Walter Jones. Here is a character that can easily be infuriating, but because of deft writing and Jones’ natural charisma, Harlan winds up likable, if very flawed. Being the lone human among the group of kids, he is the only one who doesn’t have a super power. Looking at this western fiction through a racial lens, it is very interesting that Earth is represented by a black person, and that the black character doesn’t wind up covered in prosthetic make-up and have a horn coming out of his head, or some such. What makes this especially notable is that there is only one slot for an earthling among the group of kids. Not one slot for a white human male, one slot for a white human female, and another for a black human male. Therefore, the show is designed so that your typical male demographic is supposed to relate with this black character above all others. An intrepid move, especially twenty years ago. The most important characters to Harlan Band are Catalina and the Andromedan named Radu. If the male viewers are supposed to relate with Harlan, then the female viewers are certainly supposed to empathize with Catalina, a girl from Titan, one of Saturn’s moons. She is notable for being an engineering wizard and having a sonic scream very similar to Black Canary’s. Most people who remember her will probably know her best for her signature rainbow hair style, and for frequently talking to her invisible friend Suzee. Catalina from Space Cases. She and Harlan frequently get into bickering matches. Harlan teases Catalina about everything from her supposed imaginary friend, to her rainbow hair. While Catalina has plenty of quips of her own, she gracefully never says anything negative about Harlan’s flat top, even if that may have made for some great comedy. Instead, she chooses to rag Harlan on his general behavior, especially if he happens to mess up at something. As a character, Catalina is near universally recognized as a great success for Space Cases. 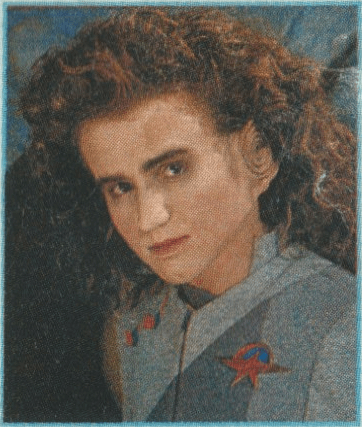 In my online wanderings through Space Cases fandom, I noticed a large percentage of fans seem to be female, and, as mentioned above, I think it is safe to attribute this to the endearing and enduring character Catalina. She is dazzlingly played by Jewel Staite, who is well known for being in other science fiction shows like Stargate: Atlantis and Firefly. Surprisingly and unsurprisingly, Harlan and Catalina’s bickering is wrought from romantic tension, and their relationship builds to the point where it becomes more prevalent and apparent. I say “unsurprisingly” because this is par the course for this type of fiction, and “surprisingly” because this is a black man exerting sexuality with a white girl who is slightly done up as an alien in 1996 on Nickelodeon. Harlan initially has a very antagonistic relationship with the mild mannered Radu. Actually, Harlan is straight up racist against Andromedans. This is a particular instance where Peter David and Bill Mumy’s writing really shines. Harlan’s sentiments are obviously wrong, and the show clearly lets us know that. Radu is presented as mild, sensitive, and unsure of himself. Conversely, Harlan is presented as a cocky, hateful bully toward Radu. This is made more interesting by Radu’s super strength (as well as super hearing), and thus his ability to crush Harlan, but the notion seems very far from the Andromeden’s mind. Radu, the crew member Harlan dislikes the most. Viewers are left wondering for several episodes why Harlan is so biting toward this particular character. It eventually comes out that there was a war between the United Planets, of which Earth is a part, and Andromedans. Harlan’s father, who he idolized, was killed by Radu’s people. Harlan did not deal with his loss that well. That doesn’t excuse Harlan’s behavior, but it makes it a bit easier to understand and empathize with him. Instead of being an irredeemable jerk, he becomes a character with quite a bit of complexity for a kid’s show on Nickelodeon. The cool thing about Harlan’s character is we naturally see his attitude change toward Radu as their adventure progresses. The development of Harlan and Radu going from frenemies to bros is totally believable. However, even when they are on good terms, they become rivals for the affections of Suzee. Yes, that same Suzee who is Catalina’s imaginary friend. It’s kind of a long story, but it’s hard to discuss Space Cases at any length without addressing it. Just as Harlan really starts getting somewhere romantically with Catalina she faux dies. There is an explosion that ignites a dimensional rift, which causes Catalina to be trapped in Suzee’s dimension, while Suzee is pulled into “our” dimension. That invisible friend of Catalina’s is actually real, but from a parallel universe. Somehow she had a connection with Catalina to where only she could see and hear Suzee. In any case, Catalina leaves the show at the end of season one and is replaced by Suzee. In the real world, I believe this is because Jewel Staite, Cat’s actress, got an offer to star in the Disney show Flash Forward, and took it. Rumor has it the writers wanted to simply kill Catalina, but Nickelodeon thought that was too much for their demographic, so they had her switch places with Suzee. That was somewhat clever, as Suzee had long been established in the show, but the execution left something to be desired. Harlan and Catalina. Surprisingly, this black man actually gets a worthwhile romance with an extremely important character. It isn’t just a one episode throw away with a guest star. The general consensus among fans is that season two of Space Cases is considerably weaker than season one. This is a consensus I agree with. Catalina’s departure somewhat screwed the show, as she is one of the most popular and important Space Cases characters. It had the domino effect of harming Harlan Band’s development, because the girl he had spent a season bonding with was suddenly gone, which was not part of the original plan. Furthermore, the patch up job the production team did by introducing Suzee was … well, a patch up job. Suzee is certainly the most controversial aspect of the show. Her presence causes many weird things to happen with the story. The biggest offender is the strange love triangle between her, Harlan, and Radu. What makes this so bizarre is that Harlan and Radu already have sorta’ girlfriends. 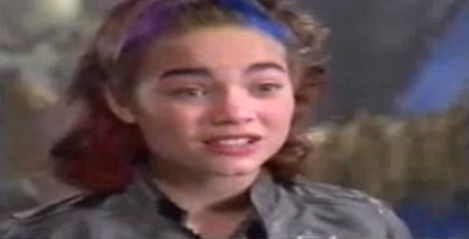 Harlan was literally in tears when Catalina left, but as soon as the attractive Suzee appears, played by Rebecca Herbst, he’s suddenly over Catalina and trying to get with Suzee. Remember how I wrote that the development between Radu and Harlan is totally believable? Well, this is the exact opposite. Harlan’s attraction to Suzee seems rushed, forced, wrong, and makes him come across as shallow. I imagine this was done because the writers wanted Suzee to fill in Catalina’s spot so much that they gave her Catalina’s man. The character Suzee is the most divisive subject among Space Cases fans. Rebecca Herbst does a good job playing the character, but fans missing Catalina and questionable creative decisions make some turn against her. Naturally, this does not sit well with many among that female demographic who watches largely because of Catalina. Therefore, many of the people Suzee is specifically targeted toward don’t like her. I don’t think Suzee is as terrible as some Space Cases fans do. However, Catalina left really big shoes to fill, and Suzee doesn’t quite fill them. Rebecca Herbst does an admirable job playing the character, yet somehow, she doesn’t click as well as the charismatic Jewel Staite. The awkward writing doesn’t help, either. Suzee wasn’t the original solution to the open slot Catalina left. The creators wanted to make a character named Elmira a regular on the show. Elmira is an oracle of the lizard-like Spung people, who are essentially the primary antagonists of Space Cases. She had key appearances in season one and formed a romantic bond with Radu. The Nickelodeon executives nixed plans to make her a regular, with their reason being that Elmira’s appearance was “too alien,” so in comes Suzee. I can’t say whether or not having Suzee is better than Elmira. I don’t want to put all the blame on the weaker second season on Suzee. Part of it rests with the Nickelodeon executives meddling with the show. One particular decision was to lessen the roles of the adult characters, Commander Seth Goddard and T.J. Davenport. The writers kept having to contrive reasons to get Goddard completely out of whole sets of episodes. I haven’t talked much about Goddard and Davenport, since the article is about Harlan Band and his most important relationships, but they are both excellent characters and a big part of the joy of Space Cases. Forcing them off screen only hurt the show. All that said, Space Cases is never a bad show… it just becomes less good. It is really enjoyable from start to finish. Nevertheless, for whatever reason, it wasn’t renewed for a third season. Perhaps the most disappointing aspect of Space Cases is that it ends without resolving anything. For all we know, the crew of The Christa is still journeying through space, and Suzee still hasn’t decided between Harlan and Radu. Space Cases is a short, but very sweet show, with only 27 episodes total. In typical fashion, the black man’s time in the spotlight of a science fiction and fantasy show is very short lived. But what a great time it is! There was a lot of great stuff on TV for science fiction lovers in the ‘90s. Fans feasted on various Star Trek shows (with my personal favorite being Deep Space Nine), Babylon 5, Space Above and Beyond, Exosquad, and many others. For me, Space Cases fits right in there with the best. It’s true it is “just a kid’s show,” but don’t let that fool you. The smart writing, great character development, endearing relationships, and charismatic actors make Space Cases a thoroughly fun, thought provoking, and touching program. By the same token, try to remember it is a 20 plus year old Nickelodeon kid’s show. There is some combat, but don’t expect much. Despite that, Space Cases is filled with moments of pressure, danger, and an overall sense of adventure. It’s definitely a far cry from Sesame Street. Also, Harlan gets to flex his hip hop kido skills from time to time (look it up if you don’t know what that is). As mentioned, there is romance, but the good bits of it (primarily Harlan/Catalina, not really anything involving Suzee) are more charming than deep, and there’s definitely nothing steamy. I immensely enjoyed my time revisiting Space Cases, and the only things I can say bad about it are mostly due to unfortunate circumstances, not because of ineptitude of the people working on it. I would recommend it to anyone, and if you’re looking for strong roles for black characters in science fiction and fantasy, I consider it a “must watch.” Harlan Band gets to be the man and I couldn’t find any trace of him being held back, marginalized, desexualed, or the typical crap that happens to so many black characters. The few negative things that hurt Harlan, such as his love interest suddenly leaving and the show ending prematurely, really aren’t specifically to do with his character. 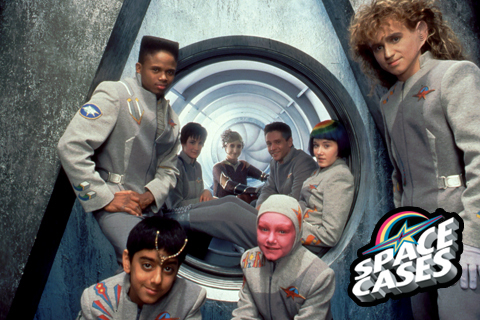 I feel like I should mention Space Cases is a Canadian show, and I have wondered if that has anything to do with it being free of the usual nonsense we often see with black characters. Harlan Band is an extremely solid black hero. He is much better than Zack from Power Rangers, who shucked’n’jived his way through a lot of scenes, wasn’t the primary leading star, and lacked a notable romance. Harlan has everything Zack lacks, and isn’t hampered by Zack’s more groan-worthy qualities. Space Cases is a very cherished memory for many who watched it back in the ‘90s, and most who have anything to say about it agree that it left us before its time and Catalina’s departure took some of the wind out of its sails. I’m surprised by how much I have said about this show, yet how much I have left out. I did not even touch on several excellent characters and memorable moments, but only because I want to zero in on Harlan Band, and there is so much I could say about Space Cases. Long story short, go watch Space Cases! The series has never been released on DVD, but fortunately, the whole thing is very easy to find on Youtube. It has a lot to offer, including one of the catchiest theme songs I have heard from television, which, over the years, I would randomly think about from time to time. It was written by Bill Mumy, who is also an accomplished musician. Harlan Band’s cool black character rating: 92% out of 100. Is the lead character on a great science fiction show from Nickelodeon. Has incredibly strong roles that would usually go to your generic white hero … except Harlan just happens to be black. A confident and competent man of action. Exerts sexuality numerous times and even has regular, worthwhile love interests with important regular characters. This is especially notable from a Nickolodeon show in 1996. Is not pigeonholed as a “black character,” but was artfully written as a character that just happened to be black. His show, Space Cases, was very short lived, with only 27 episodes total. His story, and the show as a whole, did not get a proper ending and was literally just left up in the air. His brilliant love interest Catalina is faux-killed at the end of season one, which hurts Harlan because the duo’s chemistry and back and forth are one of the main draws of the show. Harlan’s relationship with Catalina is not adequately replaced with something else, so the show, and Harlan, just get weaker as a result. Showrunners replaced Catalina with another less interesting and less likable girl who Harlan instantly takes a romantic interest in despite losing Catalina after only a very short time. This is obviously awkward and slapdash writing. The overarching love triangle between Harlan, Radu, and Suzee is not entertaining, just weird.